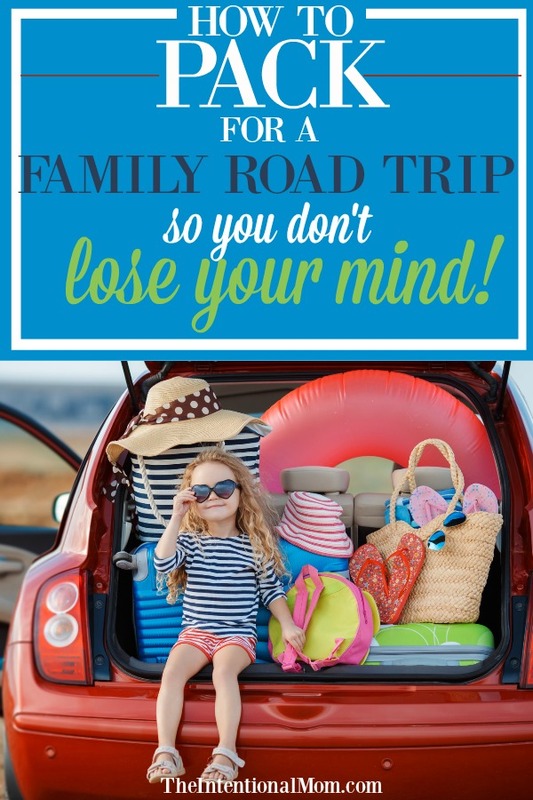 How to Pack For a Family Road Trip & Not Lose Your Mind! Do you have a family road trip coming up? Are you wondering how you can pack better so you can have less stress while heading out for some family fun? As a mom of nine I can say that road trips certainly are overwhelming, but only if you let them. It really does all come down to having some road trips tips and hacks to make things easier no matter the ages of the people who will be traveling. With such a large family, the amount of things we have to take in the car on a road trip is astounding. Much like my packing system and my packing list, I have gotten packing for road trips down to a science. I have tried packing things for kids in the car all sorts of ways, but this is what I have found to work best. The thing is, the more entertained the kids are, the more smoothly the trip goes. After all, hearing, “Are you there yet?” less is a very good thing.I have tried packing things for kids in the car all sorts of ways, but this is what I have found to work best. 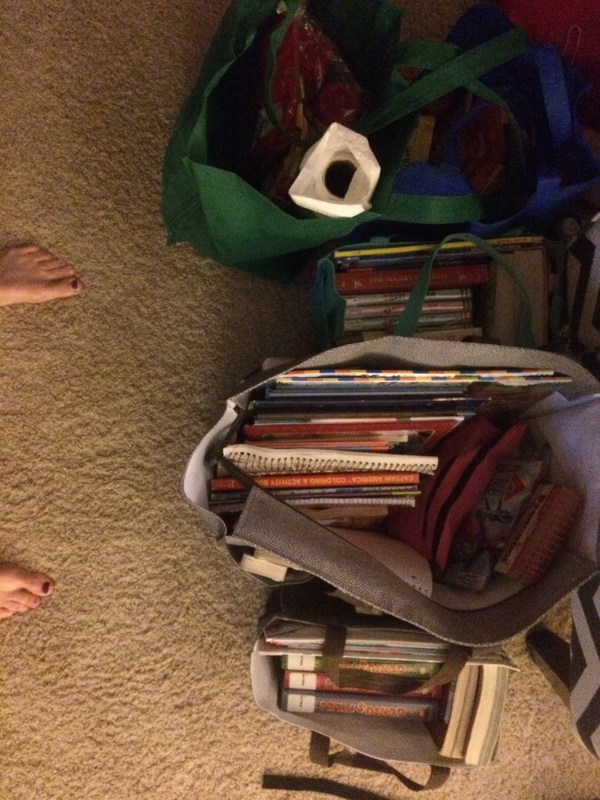 I have tried packing things for kids in the car all sorts of ways, but what I am sharing here with you today is what I have found to work best after several different times of trial and error. And, since I have a large family, being organized and streamlined is a must. Looking for more helpful advice to keep things organized? Grab my weekend checklist below. It will show you exactly what you should be doing on the weekend so you can have week days that are stress free! Success! Now check your email to download your freebie! Whether you have a road trip on the horizon or not, this is exactly what you will want to know. Here are the road trip packing hacks that can keep you sane! I like having open bags as opposed to containers or anything closed, even like a backpack. I have found that if it is too hard for kids to get their stuff, everything will just end up on the floor. An open system allows them to not only be able to get their things in and out, but it also allows them to see what they have more easily. If my kids have to work too hard for stuff, it won’t get used. I have several 31 bags like the ones below. These are PERFECT for this since they have large pockets on the outside as well. You can see all by bags and totes in action below. Another benefit of using bags is that they are collapsible when empty. If you are eating food en route, you will be able to eliminate bags as you go. 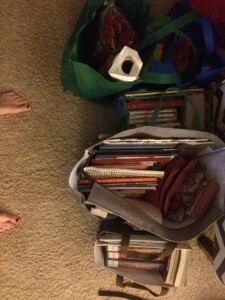 To eliminate having too many bags, I have a couple of my kids share. The little bags you see pictured have two of my older kids in each bag while the three little boys share the bigger bag since their things are bigger. Of course, there is always various forms of food that come along, but I have found keeping all the food by me to be beneficial. At least with my kids, no matter how they are told to ration their food or treats for the long trip, they always end up gone within the first 20 minutes. We generally don’t take the time to stop to eat at a park or anything, although that would be nice, we are usually in more of a rush to get wherever we are going since getting all the troops and all of our stuff mobilized takes several hours no matter how we do it. Consequently, our meals are eaten in the car. This takes some careful planning. These reusable bags are AWESOME for packing food! I often like to cook a few pizzas up and take those in individual serving sizes of foil, but in that case, don’t forget the napkins! We also do egg mcmuffin type sandwiches, sweetbreads like banana bread or honeycake, or just various snack items. If paper plates will be needed, make sure to grab them. Don’t forget to plan food for the ride home, too. I cannot tell you the numbers of times that I am only thinking about the ride to someplace while forgetting about the food we may need to get back home. Eating out is so expensive for us, and something that is annoying if we have not planned on it. As far as packing the bags go, I have my kids give me the stuff they want, and I pack up the bags. If I don’t do it this way, they can’t ever seem to remember where anything is. This way, they just have to ask me where something is (like Leapster games tucked into a pocket) and it can be found. When it comes to riding in the car, we make sure to have our children sit by their special buddies as much as possible. Not only will that make eating easier, but it will also give the younger kids someone who can read with them or play games with them. You can read more about our buddy system here. Road trips are fun, but they can also be stressful if your system isn’t working. This is the system that I have found to work best for our super-sized clan. If you’re heading on a road trip, enter your email below to grab our free Road Trip Alphabet Game! Traveling With Kids? These 10 Things Will Make it Easier! Every summer we always go for a road trip as a family. We mostly visit family and friends who are scattered around the country. My kids really love this and they enjoy being on a road trip. Thank you for sharing tips on packing for a road trip. We’ve been road tripping (often with just me as the adult) since the kids were babies. T hey are so used to the 10-12 hr drive to see family! One tip for littles is to give them a pad of post it notes, cheap tape (not as sticky as scotch brand! ), and a few pencils (give them one each….you keep the rest…they WILL lose them!). This kept my kids HAPPY from AL to NC!!!!!! The only thing I made them do was to take the sticky notes off the windows while driving thru atlanta….I just NEEDED to see better! lol! Shoot, I think as tween/teens they would be HAPPY with those 3 items!!!!! I need to get better about packing snacks and meals. I DO usually pack caffeine for the adults, oj for all of us (by hr 6, we just want SOMETHING that isn’t pretzels or crackers…and that is good for us! ), and the aforementioned crackers and pretzels. But cheese sticks and yogurt and PIZZA sound so yummy! We also bring along fruit. I just need to plan better for our meal times. Fast food leaves us all feeling bloated and gross! After 9-10 days on the road this spring, we stopped at panera bread for lunch or dinner, and we all ordered soup. AHHHH, soup! Full of veggies….light with broth. We have a 6hr trip ahead, and I will print some fun games for the kids….but really, they read a ton, listen to podcasts (as a family), and do their own thing pretty well! It took years to get to this point, but it is well worth it!